Tac Amplifier - Enhanced Hearing Like You've Never Heard Before! So discreet, no one will even know you're wearing it! Tac Amplifier is ideal for any situation! Simply place the Tac Amplifier in your ear for enhanced hearing like you've never experienced before! You can dial it all the way up for when you need to detect the slightest movements or choose a smaller boost for when you want to stay on general alert. 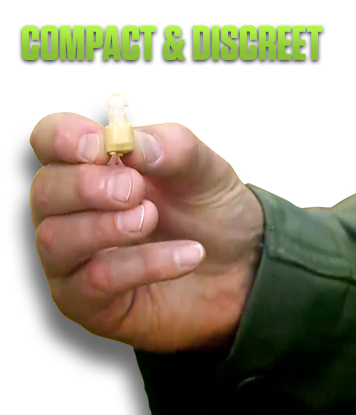 Tac Amplifier is so discreet, no one will even know you're wearing it. That makes it perfect for indoor use as well! Now, you can listen to lectures and sermons at a volume that's perfect for you. And when you're somewhere with a lot of background noise, Tac Amplifier hearing is even better than normal hearing. Tired of people complaining about the volume of the TV? With the Tac Amplifier, you can turn the TV down low and your hearing up high for a listening level ideal for everyone. Just pay a separate $6.95 fee for the 2nd Tac Amplifier! Buy the Tac Amplifier for $19.99 plus FREE SHIPPING and get a second Tac Amplifier, just pay a separate $6.95 fee!